Home Admin Announcements, The Interwebs, Yes We Can! Three years ago SoulBounce pulled off quite a feat when we won the very first Soul Train Award for Best Soul Site at the 2010 Soul Train Awards. We couldn't have done it without the work of all you SoulBouncers out there who voted for us to win, however. Well, SoulBouncers, we are proud to report that SoulBounce has once again been nominated for a Soul Train Award! 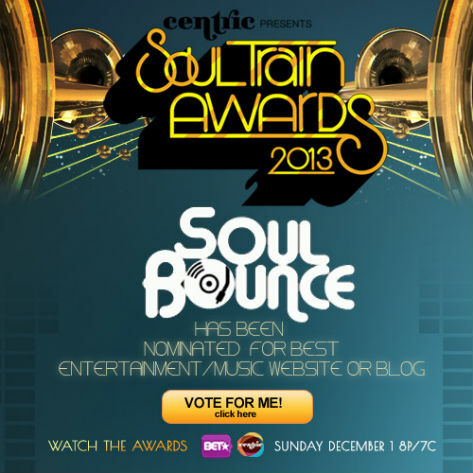 For the 2013 Soul Train Awards we are in the running for Best Entertainment/Music Website or Blog, and it's time to "SoulBounce The Vote" one more time. SoulBounce is one of five nominees for this honor, and it would truly be an honor to win and repeat our victory from 2010. And that's where you come in, SoulBounce family. You can help us to #SoulBounceTheVote by voting for SoulBounce on Centric.com now and often. Online voting will be open from today, November 6th through Friday, November 22nd. The week of November 25th, SoulBounce will also be programming a one-hour video block on Centric featuring some of our favorite music videos by SoulBounce faves and friends. 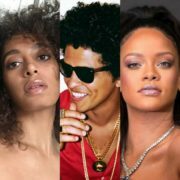 Details on that are forthcoming but what we do know for sure is that the winner of Best Entertainment/Music Website or Blog will be announced during the premiere of the 2013 Soul Train Awards on BET and Centric on Sunday, December 1st. We here at SoulBounce are truly excited about being nominated for another Soul Train Award, and winning would be even sweeter the second time around. For step-by-step instructions on how to #SoulBounceTheVote, hit the bounce and wish us luck! Instructions on how to vote for SoulBounce for Best Entertainment/Music Website or Blog at the 2013 Soul Train Music Awards. 1. Listen to and download SoulBounce's The Ultimate Soul Train Line by Darien Victor Birks Mixologists mix to get into a groovy state of mind. 2. 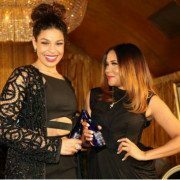 Click on http://bit.ly/SoulBounceTheVote to go directly to the online voting form for Best Entertainment/Music Site or Blog on Centric.com. 3. Scroll past the other nominees to find SoulBounce's logo at the bottom. 4. 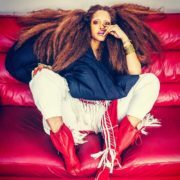 Click the circle to the left of SoulBounce's logo. The circle will turn green when it's chosen. 5. Once you've selected SoulBounce, click the Submit button beneath SoulBounce's logo to submit your vote. 6. And voila! You've placed a vote for SoulBounce, and we thank you from the bottom of our music loving hearts. 7. To place another vote for SoulBounce, repeat steps 3 through 5 as many times as you like. 8. Tell everyone you know to #SoulBounceTheVote and tune in to the 2013 Soul Train Awards on December 1st to see if we're victorious! 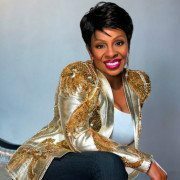 Previous: DJ Vadim Has Some Fun With Prince’s ‘Girlfriend’ Next: DMV Bouncers: Win Tickets To See Wes Felton & Wayna In Concert! 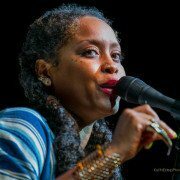 Erykah Badu Chosen To Host Soul Train Awards 2015, But Did The Nominations Miss The Mark?